Front engine, rear-wheel drive, low center of gravity, perfect weight distribution and power! In short, this is what the BMW 2 Series is. There are entry-level engines, including diesels and a 1.5 turbo petrol and even they are fun to drive. But there are also the beastly M2 cars which can go beyond 400 hp in the most powerful version. Anything other than that and ZIP BMW 230i tuning is more than enough. It is powered by a 2 l B48B20 four-cylinder turbo engine which as stock gives 252 hp and 350 Nm of torque. This is remarkably good in such a small package and it is a very fun car to drive. Some may say that the 2 l engine is not the best option. 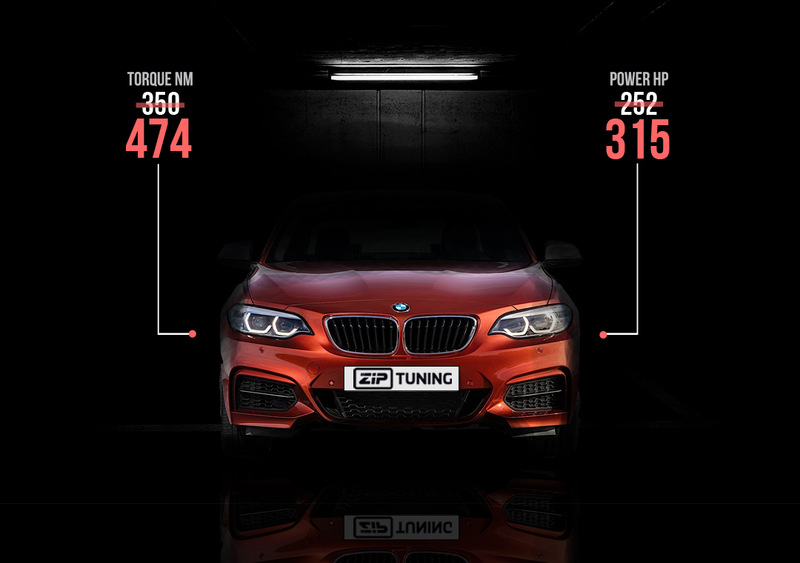 Yes, there are 3 l six-cylinder engines that give more power, but after BMW 230i tuning by ZIP Tuning the 2 l turbo produces about as much power as the I6 versions, while keeping the fuel consumption and maintenance and buying costs as low as possible. 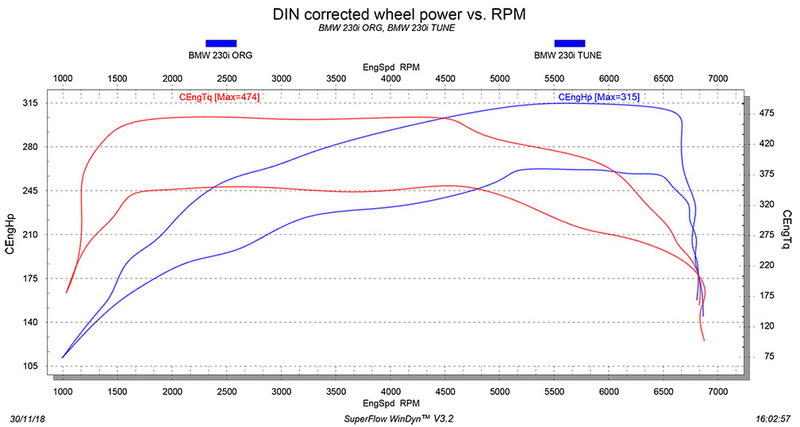 The measured power and torque after BMW 230i chiptuning came to 313 hp and 474 Nm of torque. We recently tuned the 330i GT with the same engine and even extracted a bit more power. The B48B20 engine is a wonderful machine to work on. Furthermore, having the smaller engine at the front also reduces weight and makes the car more fun to drive. The same power, lower costs and lower weight. Sounds perfect and it is! Our BMW 230i tuning is actually as sensible and smart as it is fun. If you need anything more, well, then break the bank and go for the M2. And if you want more than that even, we can also tune it for unprecedented power in such a small package. And it is as reliable and as safe as ever. Let us tell you what we did. First of all, we have to say that we consider safety more important than performance. Each and every one of our adjustments is carefully measured and it comes from decades of experience in the tuning business, extensive knowledge of our engineers, awareness of the limits of the stock parts and data logging performed on top-notch equipment. Each and every step is carefully monitored and even with such a noticeable increase in power your BMW 230i will be as safe as it was before. Furthermore, the power and torque will be available throughout a very wide RPM range giving amazing drivability in everyday conditions and on the track. Now let’s see what the changes are. The first adjustment is a change in turbo pressure. Each and every BMW 2 Series has a turbocharger, so increasing the pressure comes from a precise software modification. This feeds more air into the cylinders which is the basis for all other adjustments. For example, the second change is heavily based on the increase in turbo pressure. Namely, the amounts of air and fuel in the engine need to be at their most efficient level. So, when we increase the turbo pressure and feed more air into the engine we also need to adjust the fuel delivery. Adding more fuel to the mix to keep the perfect ratio ensures proper combustion and results in the increase in power. The measured result for this particular car is 313 hp and 474 Nm of torque. That is a bit less power than the six-cylinder versions and a bit more torque than those. So, you will get about the same power and keep sensible fuel efficiency, lower weight for improved agility and lower maintenance costs. There is so much more to be said and done to this car. For example, we also temper with ignition timing. Once again, safety comes into play, as advancing ignition too much can bring serious problems with reliability, while retarding it too much produces a lot worse driving feel. So, once again, measuring, data logging, testing and loads of knowledge show their importance. This owner of the 230i knew that ZIP Tuning was the place to come to. For this particular car we followed the OEM software architecture. In lower RPM sections we advanced ignition timing to the earliest point which is safe to give the car more boost as you start building up speed. As pressures inside the cylinder rise, we ease back a bit to ensure safety and as they start dropping in higher RPM, we advance it a bit more to add a bit more torque for those high sections. The result is the torque curve that follows the shape of the OEM measurement, but at a higher level. Not only do you get more power and torque, but you get it in a range that you can use for everyday driving and on the track where you will make jaws drop with your newly gained performance. The result is remarkable. First of all, the width of the range where you will find top torque is absolutely wonderful. Whenever you press the pedal, the engine readily delivers the push. Secondly, reaction time is greatly reduced. Literally, the instance you press the pedal, the car jumps. You may think it reacts rather well as stock, but the difference is more than noticeable and it was actually the first thing the owner commented on during the first test drive after our BMW 230i tuning session. Combine that with the added power, and you get a feeling that is difficult to describe. It literally feels like a whole new and a much more powerful car. The BMW 2 Series is made to be a stylish, sporty and a fun car to drive. Why forfeit any of those simply because yours is a four-cylinder one. We can make it rock! If you are looking for additional tuning stages, feel free to contact us and see what heaps of power we can give you. And if you are a tuner who feels our expertise could benefit your customers, register on our portal for free and start enjoying the benefits that ZIP Tuning provides.